On a cold winter day in 1987, a hotel Chef was preparing waffles and omelets in The Oakroom Ante room for Sunday Brunch. He looked out toward the number three elevator and to his surprise, he saw a lady with long dark hair wearing a long blue chiffon dress walk into the elevator. The doors were still closed. He reported what he observed to security. Within minutes of his report, a housekeeper from the second floor reported seeing the same lady. In both reports the doors to the elevator were never open. 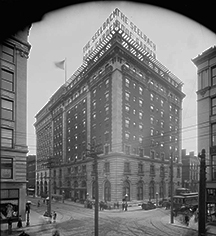 A trip to the local library produced a newspaper article from 1936 where a lady working at the Starks building came across the street to the Seelbach Hotel to meet her husband. He, unfortunately, was killed on his way to the hotel. 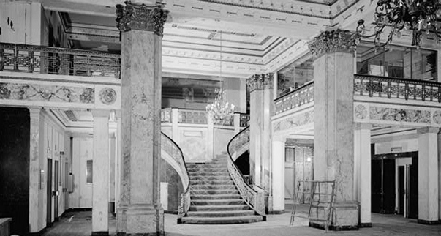 She was so upset she plunged to her death in the number three elevator shaft wearing a long blue chiffon dress. She also had long dark hair. The lady in blue has not been seen since.